Create a studio-quality light with an on-camera flash by using the Flip Flash Bracket from ALZO. Able to hold up to two flashes and accessories up to 14" above a mounted camera, this bracket is able to deliver a unique look for lighting that is more controlled and pleasing than a standard shoe-mounted flash. 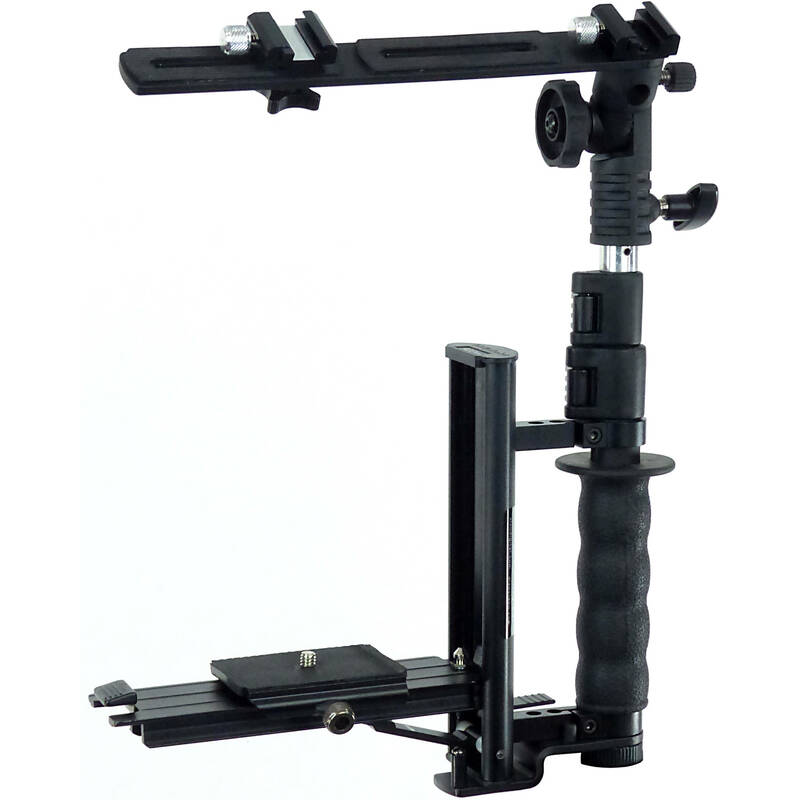 It can also hold up to 10 lb when not mounted to a tripod and can flip quickly from horizontal to vertical shooting positions thanks to an auto-lock system. A rubber handgrip improves comfort by providing a solid grip for the operator and the top of the bracket offers a tilting flash mount bar with two insulated shoe mounts. Also, there is a 5/8" stud at the top for standard lighting equipment. For quick mounting, a 2.5 x 2" quick release plate is used for the camera. Also, the aluminum bracket has a 1/4"-20 tripod thread on the handle base, and while tripod mounted it has a load capacity of 5 lb. Additionally, it comes with a black nylon carrying bag. Box Dimensions (LxWxH) 11.45 x 6.25 x 3.15"
Flip Flash Bracket is rated 4.3 out of 5 by 3. Rated 5 out of 5 by Picture Guy! from great product This is my second Bracket of this type, so far and it is the best of ALL the camera bracket I have purchased in more the a thirty year Period. As a Old Timer, I will tell you. Nothing beats having the right tools to do the job right the first time. This Bracket Really Rocks! Rated 3 out of 5 by Lara from Well built, but ... bulky While no petite, this arrangement turn out to be too bulky for my hands after a couple of hours long session. with Full flash & MagMod. The bracket is well built and likely from the best materials, however extra 1.5 lbs just can't be discounted. Rated 5 out of 5 by Stanley from Accommodating Great bracket. Its just you have to be use to and familiar with what you are about to do, but everything Is there, the camera, flash, video light and shotgun mic. Lift weights! It appears to me that this would end up on the right side of the camera when mounted, with your hand being placed between the two vertical portions of the bracket. If that is correct, does it make it difficult to reach the back button focus with your thumb? How you position the ALZO Flip Flash Bracket would be up to you; you may use it so the riser is either on the left-hand side or the right-hand side of the camera, whichever seems easier for your usage needs. If the riser is set to the right-hand side of the camera, depending on the size of your hands, yes, it could be harder to reach the back AF focus button on the rear of the camera. It will also be harder to reach the shutter button, and as such, the RPS Lighting Shutter Release Cable for RS-0420 / RS-0424 TTL Flash Brackets would be recommended (depending on the brand/model camera you own). Does ALZO Flip Flash Bracket come with hot shoe? Will this work with a camera that has a battery grip attached? Not sure, as I don't use one, but if your battery grip has a 1/4 20 thread on the bottom, my guess is yes, it will.